When I was growing up, I never really paid much attention to sweet potatoes or “camote” as they call it in my part of the world. An occasional “camote-cue” during recess time in school sums up my bond with this root crop – and only if the “banana-cues” (my all-time comfort food) available are all dried up and yucky. In recent years though, I’ve developed a deep affection for sweet potatoes that, despite its name, is not related to potatoes at all. A highly nutritious vegetable, it has become a staple in my kitchen. I particularly like the orange-colored variety as it has a more distinctive sweet flavor and having more beta-carotene than those with lighter colored flesh added to its appeal. And as with all kinds of sweet potatoes, it is rich in complex carbohydrates, dietary fiber, vitamin C and B6. How can you not love that? I’ve always had it as a sweet treat but I recently discovered that its sweetness is a delicious contrast to savory ingredients. 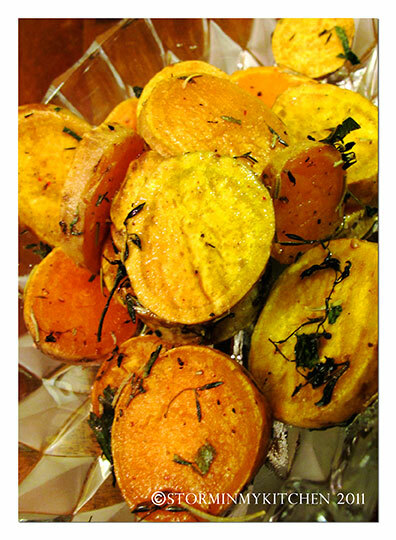 I don’t remember anymore where I came across the idea but my favorite way to make this simple dish is to slice* the sweet potatoes as desired, sprinkle some sea salt, herbs and spices and blend with a bit of EVOO (extra virgin olive oil). Roast until sweet potatoes are somewhat caramelized or tender. If I’m in the mood for some heat, I add Paprika or a bit of Cayenne Pepper. In the photo, I added flat leaf parsley, some rosemary and probably even some fresh thyme — giving it a slightly peppery / minty tang. Either way I give my 2-thumbs up to this tasty side dish that sometimes suffices as a snack or even a quick meal. Try it too with cumin, coriander and lemon or lime juice; how about your favorite cheese and bacon? Or just plain salt and pepper… the possibilities are endless. * There is no need to peel but make sure it is scrubbed well to get rid of the soil. I have to try this way. We make sweet potato in lieu of real potato for mashed potato on thanksgiving. Also love to order it as sweet potato fries on restaurants. It’s a very versatile ingredient I thought. 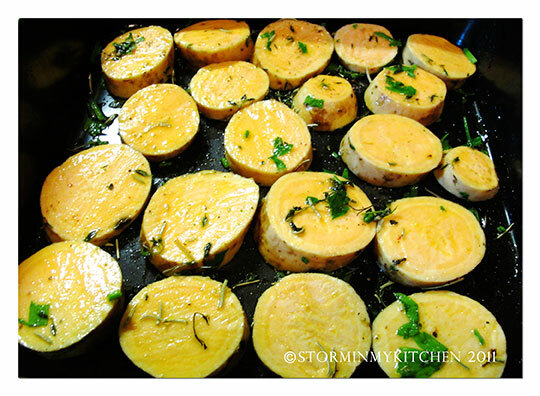 You are currently reading Roast Sweet Potatoes at Storm In My Kitchen.